The image above is an image of a powder box. This powder box was created by Henry Birks and Sons in the year 1944. This powdered box belonged to Helen Hayes. Within the powdered box, there is of course powder and a round sponge. This round sponge is applied and blend the powder on the face of the individual. Additionally, this product was made in Canada. The use of facial powder can be traced back to the Egyptian Era. During the Prehistoric Times, several countries created and incorporated the use of facial powder for civilians. The facial powder was known to be made out of raw material (plants, fruits, and stones) that were repeatedly crushed into smaller, smoother pieces creating a product that is known as powder today. Many people wore this product to make themselves look more attractive, or to cover up an embarrassing scar. Unfortunately, not everyone was given the opportunity to wear this facial powder. Only those of higher class status was able to wear this product, meanwhile, those of a lower class status were only left with the desires of wearing it. There were multiple reasons why those of the lower class, colored individuals and minorities, were unable to wear these products. The first reason was, of course, they did not have enough money to purchase this product, and second because the powder only had pigment of light shade. If a colored person were to apply powder on their face, they would not look attractive to the public eye. During this time, white was beautiful and any other shade other than white was considered unattractive and disgraceful. The image on the left is a photograph of a model named Meg Mundy. As it is seen, Mundy is applying powder on her face. The application of powder was a mark of beauty and many females of the higher class did not hesitate to wear it. They would normally wear their facial powder whenever there was a special social event, or simply whenever they went outside. The use of makeup was very popular during the mid-1900s, and those who did not have was looked down upon by society. Additionally, the description below includes another name, Lisa Fonssagrives. Lisa Fonssagrives was a Swedish model that became the fashion icon in America. Many people tried to imitate her look, as she continuously applied facial powder on her face for her photoshoots and of course when she went outside. Irene Redfield was at the Drayton Rooftop one afternoon, drinking a refreshing beverage near an opened window. Irene found it strange that a female individual was constantly looking at her while she was having her leisure time. Being at the Drayton Rooftop was a privilege that a lot of colored people who never get to see because of their economic status and race. Fortunately for Irene, she was given the ability to pass as a white person. As this strange individual kept staring at her, she had multiple thoughts about her appearance, wardrobe, and makeup. She thought that “Perhaps there was a streak of powder somewhere on her face,” which is interesting coming from a person who is passing. This is important because Irene is trying to hide behind her facial powder, but this strange female individual (Clare Kendry) was able to see right through her cover-up. This simply that although Irene tried to be someone she was not, her racial identity remained the same. 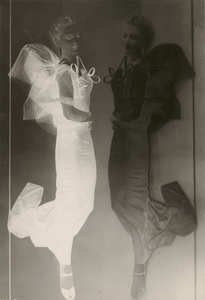 This solarized fashion photograph incorporates positive and negative images of the model Lisa Fonssagrives wearing a full-length evening gown. The image on the left is an image created by Erwin Blumenfield. The purpose of this photo was to show two sides of Lisa Fonssagrives. “Timeline of Cosmetics.” MakeUp Types – Types of Cosmetic Products, www.historyofcosmetics.net/cosmetic-history/cosmetic-timeline/. “Fashion Study, Lisa Fonssagrives, Paris (Getty Museum).” The Photography of Ray K. Metzker and the Institute of Design (Getty Center Exhibitions), J. Paul Getty Museum, Los Angeles, 1 Jan. 1970, www.getty.edu/art/collection/objects/292670/erwin-blumenfeld-fashion-study-lisa-fonssagrives-paris-american-1938/.